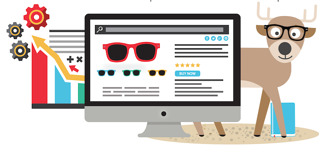 Takeaway: Product content can play a huge role in your success this holiday season. Check out our infographic on the most important ways to make sure information about your holiday merchandise is complete, clear, compelling and available everywhere consumers will be shopping for gifts in November. This holiday season retail spending is expected to be over $645 Billion – based on National Retail Federation’s projection of an overall 3.1% increase in spending this year. But before your brand can think about competing for those dollars, it has to win the consumers attention on every screen. Last year, 4 in 5 smartphone holiday shoppers used their phone during spare moments or while doing other activities to get gift ideas for the holidays. That trend doesn’t just speak to the power of the mobile channel, but the shift to a distributed commerce model, where shoppers are browsing anywhere, anytime. Below are 5 ways you can prepare your product content in order to deliver a streamlined experience across every channel to potential holiday buyers. Want more tips from ecommerce experts? Download the full eBook.